Who have you spotted lately? Should there be a requirement of photographic evidence for this thread? Otherwise this could get out of control. Nah, I'd would have been more than waving if I attempted to take a pic - no doubt sailing off into a ditch! The PradoPoint forum boys do this with different points for spotted, confirmed and photo evidence. I think you'll find that the PradoPoint team have changed that and are now required to post photos of their finds. The grass is greener where you water it..
i imagine this could get dangerous.. every time i try to take a photo with the blackberry while i'm driving i nearly always cause an accident !! Yeah, I tend to leave those photos go by or let the Co-Pilot take the photos... works out better for all concerned. No mate we aren’t required we are more like encouraged! Hahaha go the pradopoint.com people! I have been branded with a PP sticker but now I need to get me a my swag sticker… hahaha on to figuring out where to get one of those. only signed up today. We should all be out enjoying the sunshine! hahaha on to figuring out where to get one of those. only signed up today. I don't have a sticker yet....but I have a Explor Oz wheel cover if any one spots that....lol. Might spray over it and change it to My Swag!! I spotted a black pradopoint Prado at the Falcon Maccas south of Perth a week or two ago.. Wod I win? Had a white one follow me south along the F1 freeway in Sydney in Jan this year too..
That would get you two points Joff ( one for each) if the owner came forward and identified himself you could increase that. Photo's again are worth more and easier to identify. Saw a green Toyota Tercel/Corolla towing a softfloor camper on Putty Rd near Broke Rd today. Thought it might be Darrens touring rig. Couldn't get a photo as we were travelling in opposite directions. If the driver looked like this it probably was him. More than likely on the way to a MOUSSING or blue rinse. Aint fishing fun!!!! When I saw it i cracked up after re-reading his signature last night. Spotted a very well accessorised Prado parked in the main street of my local town this morning. Quite obvious, as it had a large sticker on the window advertising another online forum. I was going past too quick to see if there were "MYSWAG" stickers attached. Bit unusual as Myswaggers around here normally get spotted at McDonalds. 4wdAdventurers.com - "For those who enjoy the great outdoors!" A slightly different "spot". Issue No142 of 4wd Action (current mag ), page 255,look closely at the pic of the white L/C105 with a bloke standing on the roof rack. I didn't recognise the name in the story, but you can clearly read JOF on the rego plate.The story then sounded familiar. Bevan. GQ 4.2d;usual off road goodies;h/made fridge slide /roller draw system;cago barriersetc. Tows a '06 trackabout deluxe tourer with some safari options. Spotted a ct-less PATROL KING heading north on the Bruce Highway at Burpengary about 10.30am today! At least I think it was him, or his 4x4, with the upside down writing on his rear bar gave him away! 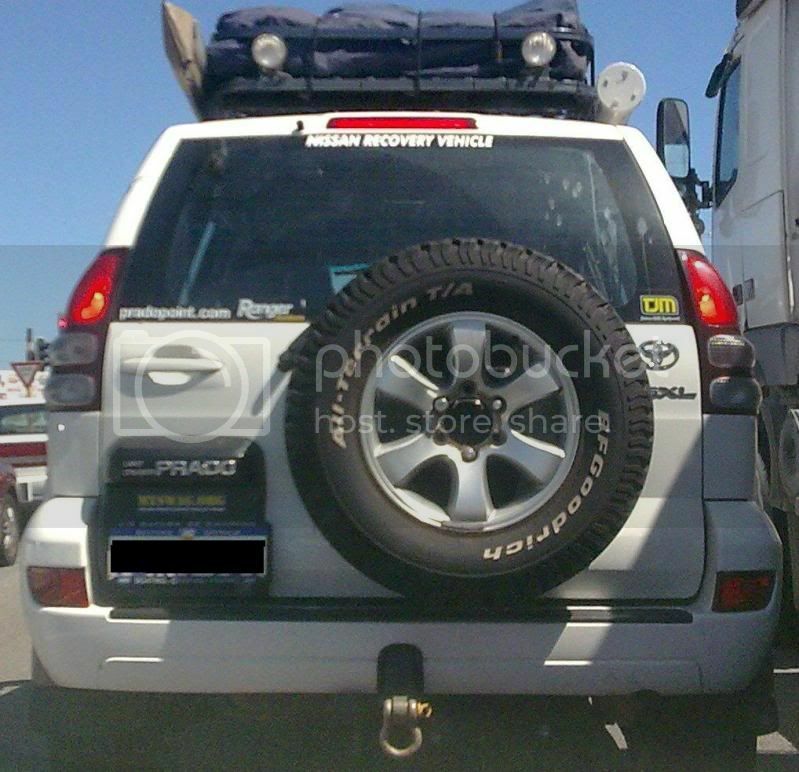 Spotted a White Prado in downtown Bundaberg (QLD) yesterday 3rd December just after 9am. Had the pre-requisite MYSWAG sticker on the rear window. Even took a photo with my phone as I was stuck in traffic! Don't ask me how I get it onto the computer though. Spotted what appears to be the Do's at there secret Peruvian retreat. Just when you think you have travelled far enough away from civilization to escape all of the paparazzi, out pops a rogue paparazzo, hell bent on snapping an award winning pic. I thought it was a bit suspecious when I saw an unmarked Tercel making its way along one of the gullies down from our camp.